Pyramid Life Crisis: Dr. Ed Bauman, founder of Bauman College, imagined an alternative to the USDA nutritional guidelines years ago. Now the rest of the world is catching up. Unlike some inquiring minds, I don't know if the Egyptian pyramids were built by aliens. But I think it's possible that our USDA dietary model, a.k.a. the food pyramid, may have been developed by grain-growing, milk-loving aliens who exercise considerable influence in Washington. On first glance, the USDA pyramid appears relatively balanced. Broken up into six groups--grains, veggies, fruits, meats, dairy and fats or oils--it recommends how much intake is OK for each. But the pyramid, like many Americans, is heavier and wider on the bottom, providing for six to 10 servings a day of breads, cereal, rice or pasta. With its emphasis on carbs and dairy increasingly unpopular in an Atkins-obsessed world, the pyramid has been under siege from all sides of late, with some U.S. policymakers calling for a completely new definition of nutrition. One man, as they say, saw it coming. Dr. Ed Bauman has been challenging conventional wisdom in the field of nutrition for 25 years. In the 1970s, he was a founder of the Berkeley Holistic Health Center, which made a huge splash with the bestselling Holistic Health Handbook. In the 1980s, he founded the first state-licensed nutrition-training program in California. He laid out his own nutritional model in Eating for Health, and the Santa Cruz branch of Bauman has been educating students on the cutting edge of "holistic nutrition" for the past decade. "The USDA approach is a high-carb, low-fat approach," says Ramona Richard, a passionate nutritionist and instructor at Bauman College. This is a more balanced approach." The Bauman camp has long held that the government nutrition model carries too much weight below the belt. At the Santa Cruz institute, they've been teaching chefs to think outside the pyramid-shaped box--though until they recently upped their profile with a website, they were so well tucked away on the east side that nonfoodies didn't know what was going on in there. "There was some confusion about what we were doing here, which has been eradicated since the website has come up," says primary culinary instructor Kathy Cummins. "Once in a while you'll get someone who has seen cooking shows on TV, with the spit-shine stainless steel kitchens and the hats and the carved food decorations and making fancy desserts, and they come here." Indeed, Bauman College is not training culinary students to prepare haute cuisine in four-star bistros. They are providing comprehensive nutrition and culinary training based on a holistic, whole foods approach. Here, food should not only taste good, but should be studied and prepared for its therapeutic properties. When I nosed my way into their classroom recently, I found a group of six culinary students eager to prepare a meal with the express intention of treating the topic of that day's lecture, Candida albicans, which is an overgrowth of yeast in the body that can turn into a systemic fungus with many harmful or discomforting symptoms. Bauman's vision is laid out in Eating for Health. Its foundations are a diverse, predominately plant-based diet that draws on a wide array of organic, whole and seasonal foods. Eating for Health recommends a reduced carb intake of two to four servings per day and puts root vegetables and squashes in a "starches" category along with other whole grains. This eliminates the reliance on processed, refined grains and replaces them with certain "starchy" veggies that have a higher glycemic index and vitamin content. There are two other important differences between the USDA pyramid and the Bauman model. One is that the pyramid devotes a lot of space in its Valley of the Kings to the dairy group, which in Richard's opinion, should be mummified. "The problem with dairy is twofold," she says. "One is that it is one of the most allergenic foods there is, and two, it's very mucous forming ... there's a lot of downsides to milk." The Bauman ethos holds that milk, a whole food containing a balanced delivery of carbs, fat and protein, is a good source of protein, but is only one among diverse animal and plant sources. "There is an overemphasis on dairy in relation to everything else," says Richard. "If you cut milk out of the diet, a lot of the ear infections young children experience would go away. But mothers are sold on milk." Looking at the USDA model, one would think that eating any kind of fat or oil is punishable by death. We're advised to "use sparingly." Yet seeds and oils are at the very core of Eating for Health. Richard says that a seed is the beginning of life for a reason and that seed sources such as flax, sunflower and sesame contain the essential fatty acids necessary for human life itself. "We have to have them for life and since the body cannot produce them, it is essential we receive them from dietary sources," she says. "If we had none at all, we would die." It's interesting to note that the USDA pyramid does not even address the importance or relevance of liquids in one's diet. In fact, though our bodies are predominately water, the USDA model only specifies one liquid on its entire chart: milk. Yet Bauman has placed four distinct groups of liquids in his outer ring including pure water (not tap), mineral broths, herbal teas and fresh juices. 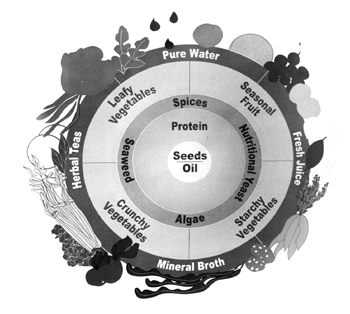 In association with an inner ring of booster foods (algae, seaweed, spices and nutritional yeast), these two complimentary areas buffer and supplement solid foods--and if you're ready to step away from the pyramid, the Bauman folks will help you design a diet for optimum health rather than just general maintenance.